A gift for melody—as a songwriter and/or singer—can be both a blessing and a curse. A blessing because there are few pleasures in pop music more satisfying. A curse because such pleasure can so easily lapse into maudlin sentimentality. Death Cab for Cutie’s Ben Gibbard has this gift, and on the band’s new album, Narrow Stairs, he seeks ways to enjoy melody’s gratification while warding off its schmaltz. The album opens with producer Chris Walla’s nervous electric-guitar strum and Gibbard’s high tenor warbling fetchingly about hiking beneath the “Bixby Canyon Bridge” in Big Sur. When he sings about hoping to hear the ghost of someone whose “soul had died” there (maybe Jack Kerouac, whose nightmarish novel, Big Sur, was based on events in that canyon), Gibbard’s song teeters on the edge of mawkishness. It pulls back, however, when the singer realizes he’s not hearing any ghosts, just the babble of the creek and the whistle of the wind. “I cursed myself for being surprised,” he confesses, “that this didn’t play like it did in my mind,” and with that, the quiet, melodic vocal is suddenly assaulted by a stomping, hard-rock riff as if a dreamer has been knocked upside the head by the two-by-four of reality. The melody doesn’t disappear, but now it has to fight to be heard. There are similar confrontations between pretty tunes and distorted noise, between romantic feelings and harsh consequences throughout the disc. Few tunes are prettier than “No Sunlight,” which begins with a McCartneyesque lilt over a charming guitar arpeggio as Gibbard sings of lying in the grass beneath a blue sky as a young man. In subsequent verses, however, he describes clouds slowly filling the sky, blotting out that early innocence. As he does, weird guitar effects begin swirling around the melody and eventually pull the original optimism down a hole of feedback. When the bridge arrives after the second verse, the bristling guitar chords and booming bass are replaced by lovely guitar, and the bitter accusations give way to a quiet admission of sympathy: “You said your vows and you closed the door / On so many men who would have loved you more.” It’s clear that the singer is one of those men, and when the lacerating guitars return, they slash at him as much as her. It’s the kind of sobering catharsis you’ll never hear from Coldplay, but it’s also the kind of clearly articulated narrative you’ll never hear from Radiohead. Gibbard is at his best when he tethers his catchy tunes to lyrics grounded in specifics—a creek beneath a Big Sur bridge, the receiving line at a wedding, a closet full of clothes that “hang like ghosts of the people I’ve been,” an old friend so disillusioned by romance that he or she tosses out the old queen-size mattress and replaces it with “Your New Twin Size Bed.” He runs into trouble when he starts singing lyrics as abstract and vague as those in “Pity and Fear,” “The Ice Is Getting Thinner” and “I Will Possess Your Heart.” When there’s nothing specific to pull him back to earth, his words drift off into cliché; the band’s pretty-versus-harsh arrangements seem merely clever, and the hooks get orphaned. And because the harmonies aren’t all that sophisticated, they can’t pick up the slack. But when Gibbard gets out of his own head, the confrontation between his tuneful optimism and the real world can yield an exhilarating dramatic tension. This is most obvious on “Grapevine Fires,” which begins with a terrific push-and-pull drum pattern, chiming electric piano and a vivid description of fire racing through coastal vineyards. When Gibbard suggests that it’s only a matter of time “before we all burn” in some ecological catastrophe, he suffuses that phrase in sunny California harmonies. He takes his girlfriend and her daughter to a cemetery to watch the nearby fires, and the listener might worry that he’s proposing a form of domestic escapism. But he makes no effort to deny the threat of possible “end days”; it could very well all turn out badly, he admits. But he also refuses to deny the very real pleasures of a lover and a child. 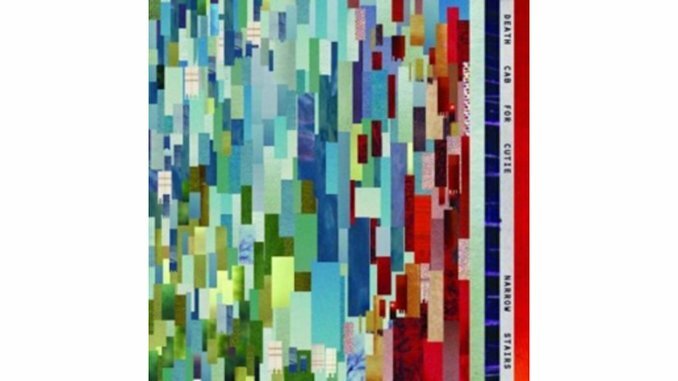 Death Cab for Cutie juxtaposes these two truths the same way it conjoins the intoxicating melodies with distorted guitars, seething synths and metal-funk bass, achieving a balance of pleasure and frustration that closely resembles the world in which we live.